The Hippopotamus is an extremely fat animal, with a round body, short, stocky legs, and a large head. 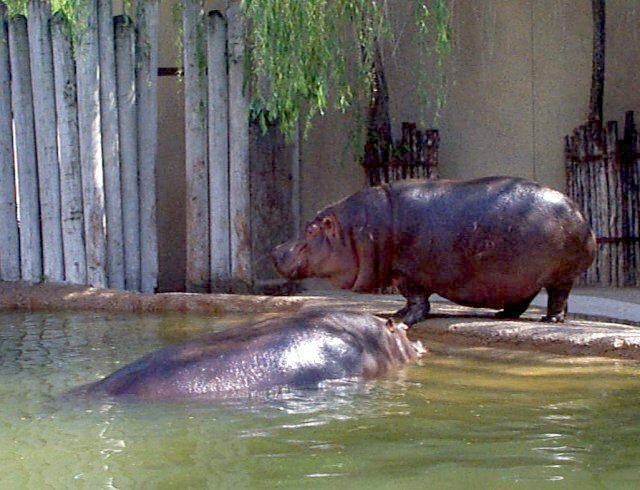 Female Hippos are usually slightly smaller than the male Hippos. The male Hippo can grow up to twelve feet long and five feet high, and can weigh up to 8,000 pounds. 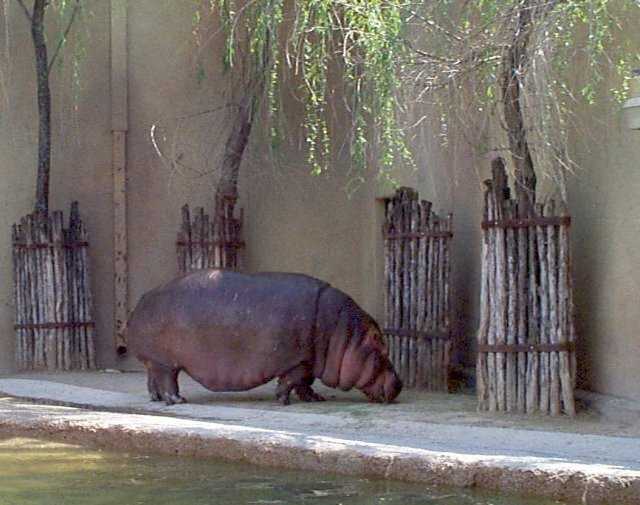 The female Hippo, however, is slightly smaller. The Hippo's body is a brownish-gray color on top, and paler on the underside, with pink areas on the face. Eyes, ears, and nose of the animal are high on the face, allowing the animal to be almost totally submerged when it is in the water. The Hippopotamus spends their day lying in the water, with oily secretions helping protect the skin from the sun. 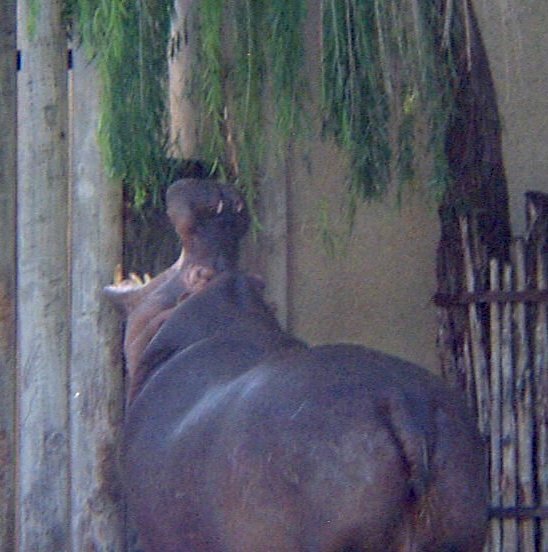 Hippos spend their nights grazing. Hippopotamuses live in family groups with one male, several females, and their young. 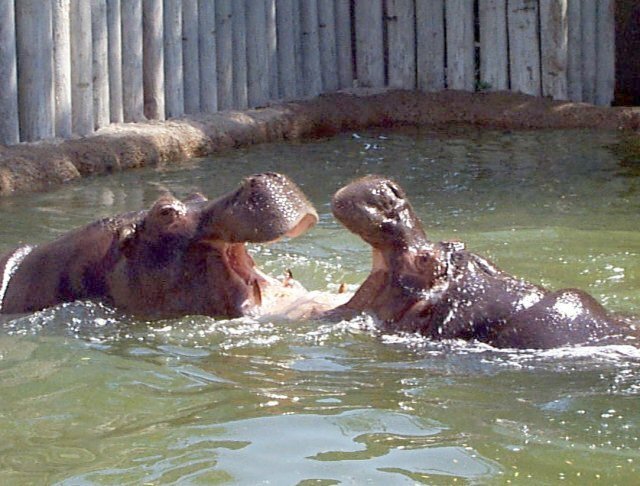 Video of hippo courtship at the Smithsonian Web Site. The Hippo rivals the Rhinoceros for the title of the second largest land mammal. The stomach of the Hippo has three chambers, but is non-ruminating. The life span of the animal is 35 to 50 years. The Hippopotamus spent the entire time in the water while I was there. Other than coming up for a breath of air every now and then, the Hippo may have moved may be twenty feet. 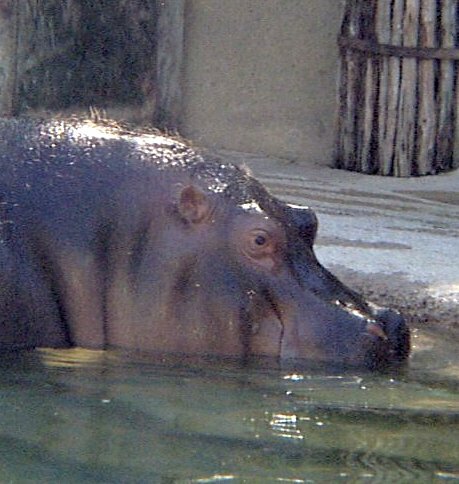 There are two Hippopotamuses currently at the zoo and both of the animals seem to be extremely fat. The skin is dark and hairy. 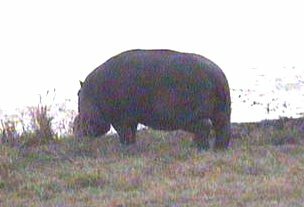 The Hippopotamuses were in the water for so long that there was nothing to really record because I could not see them. I can see the troubles researchers can have in doing research on the animal. Since the animal spends most of the day in the water and comes out at night graze, it causes a problem in doing field research. Dr. William Barklow has spent many years studying the vocalizations of hippos. These are rarely heard by humans since most of them occur underwater, but calls as loud as 115 DB have been recorded. Hundreds of different calls have been identified. These calls may function like bird calls, as a means of social communication. Klingel, Hans. "Fluctuating Fortunes of the River Horse." Natural History, Vol. 104 (5): 46-57. May 1995. Hans Fradrich, Ernst M. Lang. "Hippopotamuses"